Nabr Network is a communication technology company focused on serving Community Associations – homeowner, condominium and other like common ownership communities. Help community managers and management companies be efficient and effective communicators to their boards, committees and residents. Help community association boards and committees maintain transparency and get the official association news out to their residents. Help residents be better informed of association business and engage them in community happenings. 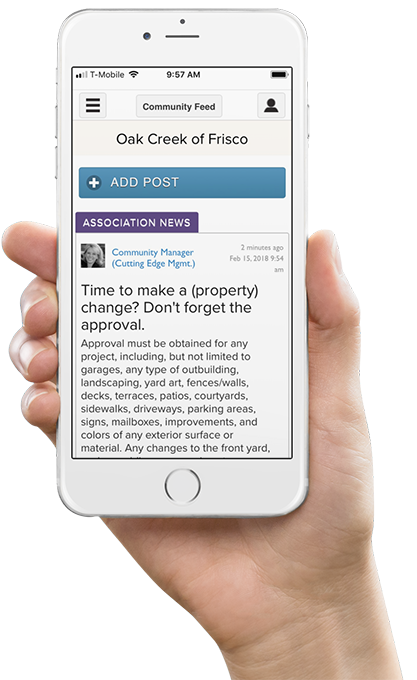 We accomplish this by creating, operating and supporting an easy-to-use communication platform which has specifically been designed for community managers and their neighborhood associations. Just as important as great technology, Nabr Network provides unmatched customer support to its management professionals, HOA boards, committees and residents. We are the first line of support for resident registration, login issues and common user questions about our platform. We also provide responsive support for managers and frequent training programs to keep managers efficient and effective with their HOA communication tasks. To that end, we simply want to be thought of as an extension of a management company or association’s staff. With Nabr Network, you get great technology, and real people who believe great service is equally important. We take ownership of our responsibilities and strive to understand and fulfill our clients’ needs. We work hard to make our product and services intuitive and simple to use. We are honest, do what we say, and follow through on all commitments. We view the whole more important than the individual and will always support our coworkers. We are passionate about being the best in every aspect of our business. We like to say informed residents and efficient managers make great communities.